Palakkad. It was the first name that sprang into Subhadra’s mind. “Palakkad,” she told her inquisitor, tired of avoiding a reply. The young man had been grilling her for some minutes now. .
“Seriously? In which state is that?” Sunjiv asked, uncertainty clearly written on his brow. Subhadra decided to take a chance. “Kerala,” she told him rashly, making a mental note to check it on Internet the moment his back was turned. Sunjiv worked in the HR department, and sat in a cabin opposite to hers, at the far end of the big hall. Once he heard her speak into the phone in impeccable Punjabi, and sauntered across to her table on some pretext. He began a casual chat on a small office matter. Soon she got used to making small talk with him. They conversed in English, always, till one day he dropped a line in Punjabi and she replied in the same language. He seized the opportunity swiftly. The cocky lad should have seen it coming, but did not. “Oh no, how could you think that of me?” she pouted, sounding offended. “So, are you an Englishman by the same criterion?” she retorted. “Why, do I look like a Bengali?” She was beginning to enjoy pulling his leg. Sunjiv was positively squirming now. She wore such a diverse range of saris that it was difficult to tell which part of the country she came from, he explained. “You mean to say I should not be wearing saris? Or only one type of sari? Or only salwar kameez? Perhaps western suits? I had no idea you kept such a sharp eye on what women wear,” Subhadra said, ragging him more. “Actually, the variety you wear is so wide, we often discuss it,” Sunjiv blurted, now profusely apologetic. “Don’t take it otherwise, please,” Sunjiv begged. “Banjyot in my department and I often talk about the way you glide into office in your crisp sari. You don’t circulate much, but whenever you do talk to someone you sound very pleasant,” he coloured deeply as he defended himself. “Is that such a bad thing?” she asked him, picking on him. She pretended to be annoyed now. “How is it anyone’s business what I wear to work?” she demanded. Subhadra decided to let up the pressure a bit. She made him sit down, and called for coffee. Soon the talk veered round to the sari she was wearing that day. It was Sambalpuri, from Orissa, she told him. Later, she accompanied Sunjiv to Banjyot’s cabin, at last making a friend in her office, indeed, two friends. Banjyot was a Punjabi, too, like Sunjiv. She had little knowledge of saris, being more inclined towards western attire. The trio shared some light moments over the episode and then headed back to their respective desks. Subhadra’s saris helped cement the friendship. Sometimes she told the duo how she had picked out a particular colour combination. 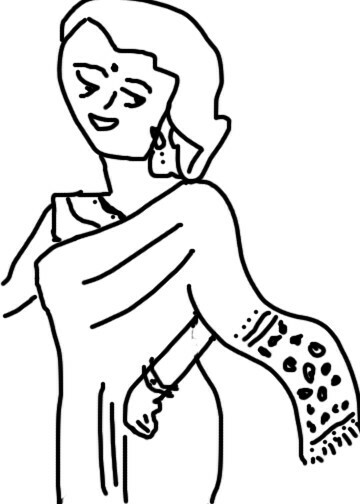 Sometimes her new friends tried to guess the type of silk used in her sari. Almost every sari had a story behind it: how Subhadra’s husband had pulled out a particularly striking one from a heap of silks in a South Indian shop, how husband and wife ended up buying the same shade of rust at separate stalls, and so on. A few weeks later, Subhadra decided to tell Banjyot the truth about herself, but waited for a good occasion to tell Sunjiv. “Well, it took some effort on his part convincing me,” she smiled naughtily. “I don’t believe you, ma’am,” Sunjiv said indignantly. “You spun a romantic web about my marriage, and I led you on because you were so hung on it,” she replied. “It’s just that I’m a cosmopolitan Indian woman. My husband and I share this love for all types of saris. It helps that I have a non-Punjabi look, which fooled you. I just played along, man,” she replied. Sunjiv’s bewilderment gave way to a sheepish grin when he realized how his runaway imagination had invited an elaborate joke on himself. This deserve to be passed on to Sanjay Leela Bhansali with title Indian Saris -national integration route/symbol. He may need assistance of author in accomplishing the mission. hahahaha...i know the inspiration ;) and as usual..a superb piece!! very interesting...spinning a story around saris.